France's finest exponents of the mysterious art of 'Freecore', channeling music and electricity from the depths of the mulitverse through free improvisation, acting as a portal for a punk rock universal consciousness to communicate with its errant offspring. What we have sounds like a hybrid species of jazz fusion, punk rock, doom metal,Krautrock and the soundtrack to the 'Forbidden Panet' to form a nu-beast, full of energy = MusiC squared. None of these tunes were rehearsed, and are totally improvised.With the absolute minimum of editing we present to your ZOG's second official album for your connection with that super massive pulsating brain hidden in the centre of this universe and beyond. 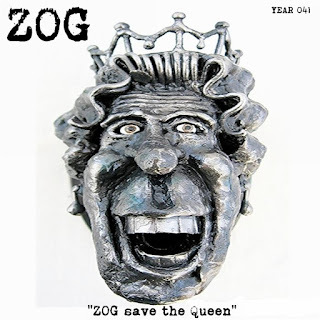 1 make Zog Not War"
DOWNLOAD ZOG to save our Queen HERE!